Would you like to see St Peters tomb at the Vatican? Find out how to book this special archaeological tour of one of the most fascinating underground sites in Rome. Are you wondering what I am talking about? Yes, you can book a special visit to the archeological site underneath St. Peter’s Basilica in Vatican City. And on this tour, one of the things you will see is the (supposed) tomb of Saint Peter. Is St. Peter really buried here? What will you see when you visit St Peters tomb? Can you visit the Vatican Museums and Sistine Chapel on the same day as visiting St Peters tomb? How to get tickets to see St. Peters tomb? What does it cost? What to do if you can't get tickets? What is St Peters tomb and where is it? What is St Peters tomb? Where is it? In the basilica of Santa Maria del Popolo, in Piazza del Popolo in Rome, you can visit the Cerasi chapel, where you can admire two stunning paintings by Caravaggio (among works by many other important artists). In this painting, Saint Peter is shown being crucified upside-down. You have to stand to the right and lean in to see it. In Ancient Rome, the dead were buried just outside the city walls, in an area called a Necropolis. It's thought that St. Peter was buried near where he was martyred, in the necropolis on the Vatican Hill (it was called Vatican Hill before Christianity came along, although there is some discussion as to the exact origin of the name). In the 4th century, when Constantine became the first Roman emperor to embrace Christianity, he had a church built on the site of Saint Peter's grave, and called it Saint Peter's Basilica. St Peter's basilica, built in the 16th-17th centuries, as we know it today. When Michelangelo was designing the current Saint Peter's Basilica, he purposefully centered the dome right over the spot where St. Peter is presumed to be buried. Later, many popes chose to be buried in the Vatican grottoes, just underneath Michelangelo's dome. Presumably they wanted to be near the tomb of Saint Peter. You can visit those tombs directly from inside the basilica, on a normal visit there. Are those really St. Peter’s remains there? Hmmmm, well I cannot answer this. If you look around on the internet, you will see arguments declaring these are REALLY St. Peter’s remains. 100%, no doubt. And, you will see equally as many arguments that say no, they are not, or at least, we just cannot be sure. On one tour, our guide was a seminarian at the Vatican. In his presentation, there was never once mention of any scholarly doubt on this subject. There was only an absolute statement that we were indeed in the presence of St. Peter’s remains. On another visit, our guide seemed to be more of a student of theology and archeology, and her presentation was quite different. She did let us know that there is some question, at least on a scholarly level, as to whether these are indeed St. Peter’s remains. She was not negative, just speaking academically. And on the most recent tour, the guide spoke of the remains but also stated all the arguments in favor of them really being St. Peter as fact, as if to reinforce this belief. All the guides were fantastic, and your visit will be fascinating regardless of which guide you get. My take is that each person who visits this holy site should absorb the information, and make their own decision as to what they believe. Is St Peters tomb worth visiting? If you have the time to plan this in advance, you can see one of the most exclusive, special and sought-after sites in Rome. I know, I said above that these may NOT be St. Peter’s remains. But, then again, they might. And 99% of the visit is about other stuff, mainly the necropolis under the basilica. Are you interested in Ancient Roman history? This tour is for you. Are you interested in archeology? This tour is for you. Are you interested in this visit from a religious or faith point of view? If you want to see one of the most sacred sites in Christendom, this tour is for you. No photos are allowed on this tour, so I don't have any of my own, except of the outside. Any photos on this page of the necropolis itself are from the Fabbrica di San Pietro, an official Vatican website. When you visit St Peters tomb, you start out by viewing a wooden model of the basilica. This allows you to understand where you will be going underground. From there, the guide will take you down to the underground excavations. Most of your tour is not actually about Saint Peter, and will be of the tombs in this necropolis . . . which are all in Greek! Ancient Greek. Yep! It's absolutely fascinating. The guides are very good, as they know this area like the back of their hand. So you really get a sense of what life, and death, were like in Ancient Rome. At the end of the tour, you will see the area where St Peters tomb is supposed to be. It's not very easy to see. In fact, you have to line up to view, one at a time, the little hole in the wall where the remains are. Finally, your guide will leave you in the Vatican grottoes. You can walk around and view tombs of other popes (this is actually fascinating too). And from there, you can go up into St. Peter's basilica. This is a huge plus, as you avoid the long queues to get in at the main entry. On the Vatican website, you can take a virtual tour of St Peters tomb on the Vatican website. The narration is in Italian, but the video speaks for itself! Once you arrive at the video of the necropolis, you can click around and see some of the tombs, and get a real sense for what you will see when you visit the site. The guided tour takes around 1.5 hours. But you should factor in the time it will take you to find the entrance, and gather and show your tickets. Then, factor in time you may want to spend on your own in the grottoes, and of course, in St. Peter's basilica. You could also climb the dome of the basilica, once you are inside. This will take another hour. So your visit to St Peters tomb will last anywhere from 2-4 hours. And this does NOT include visiting the Vatican Museums. Should you plan this tour on the same day as you visit the Vatican Museums? If you try to visit the Vatican museums on the same day that you have a scavi tour, it will be exhausting and you will have Vatican fatigue (I don’t know if that’s a thing but I’m telling you, you will). But if you have limited time in Rome and want to try to fit these visits into the same day just make sure to plan for it time-wise. Book your Scavi tickets first, because unless you book through a ticket agency, you have no control over the time (or date) they give you. Then, make sure you have about 4 hours between visits of the Necropolis and the Vatican Museums. Want more help planning your Vatican visits, and fitting it all in? Visit my page about this. How to get tickets to see St Peters tomb? There used to be only one way to get tickets to visit St Peters tomb - which was directly through the Scavi (excavations) office of the Vatican. You can still do this. You send them your request, and the dates you will be in Rome, and then you wait and hope. Now, you can finally book this visit via a ticket agency. It's more expensive this way, but they take the wait/worry out, and, you have more control over when you go. And, by booking via a ticket agency, you can usually get tickets closer to the date you want to visit. If you want to book via the Vatican Scavi office, send an email (English is fine) to: scavi@fsp.va or by fax: 011 39 06 6987-3017. You can also fill out the form on the official Vatican Excavations Office website. The dates you are available for a visit (the more options you provide, the better chance you have of getting a spot). In my experience, the Scavi office responds within 24 hours of your request, but if they don't, just be patient. If your request is urgent, you can try phoning the Excavations office at the following number: 011 39 06 69 885 318. Vox Mundi, the official Vatican tour agency, has made some time slots available to ticket resellers. Space is very limited, and it does cost more than booking directly with the Scavi office, but it's a smoother and more immediate process. With Tiqets (below), you can get your tickets right on your smart device, without having to print them out. Tickets through an authorized reseller are 59€ per person. No discounts. The tickets to this special visit are not associated with the Roma Pass, the Omnia Pass, or any other pass. There are no discounts for any reason. Book through a reseller. If you've written to the scavi office, and discovered that it's too late, and there is no availability during your visit, you can try booking through a ticket reseller. Yes, this is more expensive but if you really want to see this site, it may be the only way. Book the tour in another language. One thing you can also try is to ask for the tour in another language like Spanish, French or Italian. The English language tours are always booked long in advance, but there may be availability in another language. If you don't speak anything other than English, it may be frustrating to take the tour in a language you don't understand, but if it's important to you to see this site, you can try this option. Go to the Scavi office and ask if there are any cancellations. This is really a longshot, but you can try asking the Swiss Guard if you can go to the Scavi office, and see if they have any last minute cancellations. It's doubtful you can get in this way but you could ask. You can visit the Mamertine Prison, where Sts. Peter and Paul were said to be held prisoner before their executions. You can visit the basilica of Saint John in Lateran (San Giovanni in Laterano), the most important basilica in all of Christendom, the Pope's church. The skulls of Sts. Peter and Paul are kept in the reliquary. 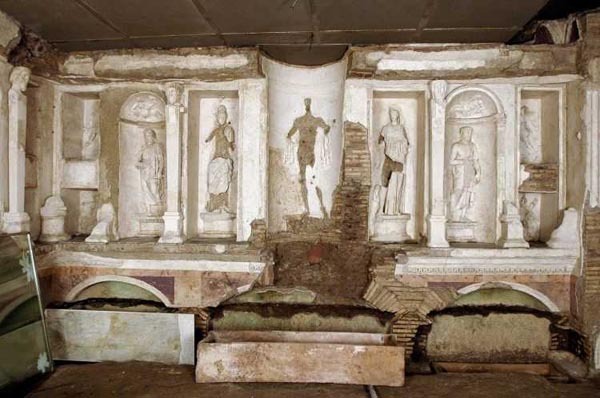 Visit the catacombs, where you can see the tombs of other saints and ancient Romans. Visit the Vatican grottoes and see the important tombs of other popes and saints. Dress appropriately - You are on Vatican property. No bare knees, midriffs or shoulders. Even in the height of summer, you will have to be respectfully covered when you visit this site, or any site at the Vatican. Be more than punctual - You are dealing with the Swiss guard here. They do not understand the meaning of the word “late." Plan for more time than you think you need. You should arrive at the gate of the Swiss Guard no later than 15 minutes before your tour begins. If you have plenty of time to kill, you can always walk around St. Peter’s Square and get some pix. The left-side guarded entrance of Saint Peter's Basilica. This is where you come to have the Swiss Guard let you in so you can make your way to the entrance of the Necropolis. How to find the entrance - You need to get to the gate of the Swiss Guard on the left-hand side of Vatican Square, behind the colonnade, i.e. outside the square. If you have any walking issues, you can have a taxi or car drop you off right at the gate of the Swiss Guard (see photo above). Otherwise, if coming from the Ottaviano metro stop, it’s a good 20 minute walk. Once the Swiss guard let you past their gate, you still have to walk to the Scavi office, which is about a 3-5 minutes’ walk. It is HOT under there - The site has to be well-sealed to keep moisture from ruining the frescoes and other art. Even though you are underground and not exposed to heat and sun, it is NOT a good place to “cool down" when it’s hot outside. So if you have a choice and can visit this site from mid-September through May, you will be more comfortable. If you are in Rome only for the summer, just remember to plan and dress accordingly and wear the lightest cotton possible. It CAN be claustrophobic - You will be underground. And some of the spaces are a little small. I am slightly claustrophobic and I can do it, but if you suffer from severe claustrophobia, this tour may not be a good idea. You may not take ANY photos during the tour. They are strict about this. The photos I published on this page are mine (of the outside), and from the Vatican website Fabbrica di San Pietro (of the inside). All-important bathroom stop - once you pass the Swiss guard and make your way to the Scavi office, you may ask where the toilet is. It is just off the little outdoor plaza there, before you enter the site for the tour. There will not be any more places to use the bathroom once you begin the tour. You will find the next bathroom once you exit Saint Peter's Basilica after your tour ends. The Domus Aurea is a must-see when you visit Rome - don't miss this special archeological visit right next to the Colosseum! Coming to Rome in April? Find out what the weather's like, what to wear, what's happening in Rome, and what to expect. Looking for Day Trips from Rome? From Pompeii to Florence to beach towns to exquisite gardens, you have a world of choices!